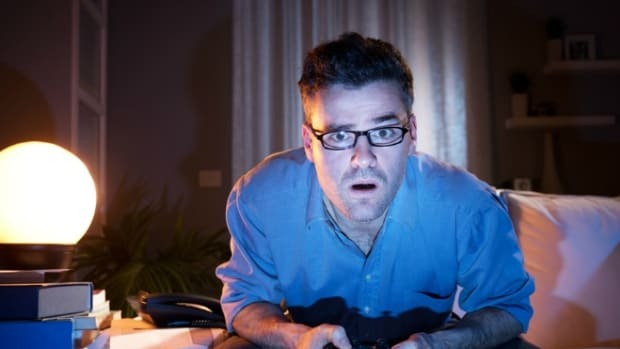 Father and son researchers studying violence in video games find that the cumulative aggression seen in the current study reflects a low-grade social violence that's ultimately more insidious than headline-grabbing meltdowns. 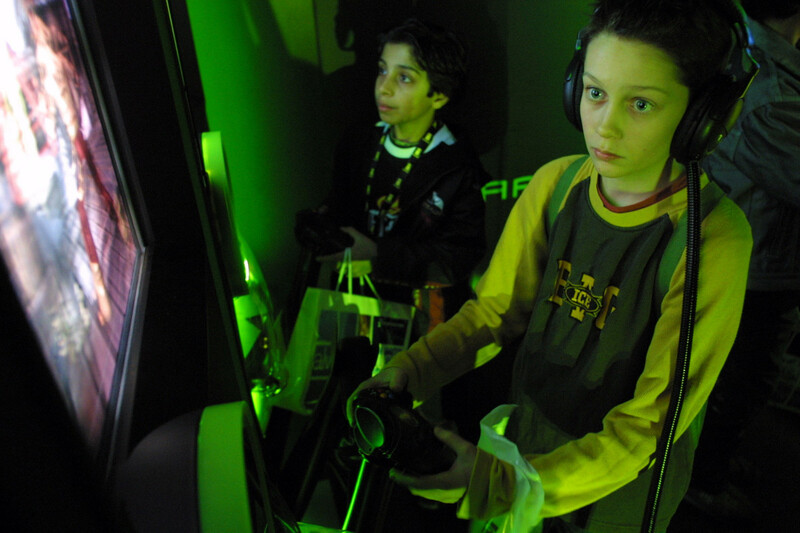 Visitors play with Microsoft&apos;s Xbox gaming system at the CeBIT technology trade fair March 12th, 2003, in Hanover, Germany. Each new popular medium, from comic books and films to pinball machines and rap music, ignites a debate that they corrupt young people by fostering violent behavior, drug use, and sexual activity. 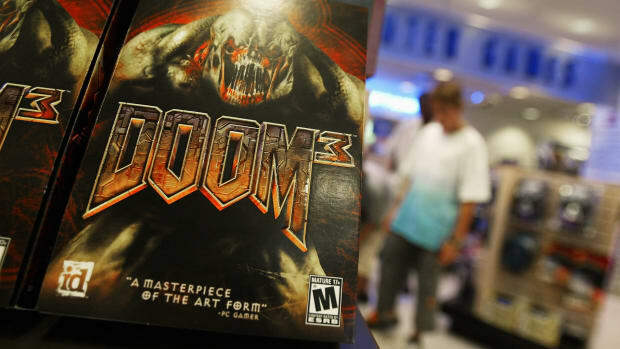 These days, much of the fuss is over video and computer games—a huge industry, with sales of $7.4 billion in 2006, comprising nearly 250 million units, according to the Entertainment Software Association, a group of game designers and manufacturers. Video and computer games are vastly more experiential and participatory than any other entertainment medium in history. Many feature bloody violence. A 2001 study by Children Now, a non-profit child advocacy organization, found that 62 of the 70 games it sampled contained violence, including many games rated as suitable for "Everyone" by the Entertainment Software Ratings Board, a self-regulatory industry body founded by the ESA. Although school shooters Kip Kinkel, Dylan Klebold, and Cho Seung-Hui did play violent video games such as Counter-Strike, Doom, and Castle Wolfenstein, few researchers claim such play by itself causes this level of violent behavior in the absence of other factors such as poverty and access to guns. But this doesn&apos;t mean video-game violence has no real-world consequences. While there is research suggesting that violent games make people more aggressive, there is no "smoking gun." A new study offers insight into the powerful appeal of video games and how they encourage violent behavior. The study, "Violent Video Games as Exemplary Teachers: A Conceptual Analysis" by the father-son research team of J. Ronald Gentile and Douglas Gentile, argues that violent video games use several extremely effective teaching tools to reinforce violent thoughts and behavior. Ronald Gentile is at the State University of New York–Buffalo, and his son Douglas is a psychology professor at Iowa State University and director of research for the National Institute on Media and the Family. Their study appeared in November of 2007 on the website of the Journal of Youth and Adolescence. The brain, Douglas Gentile says, becomes what it practices. Violent games teach aggression efficiently by featuring clear objectives, multiple difficulty levels, a pace set by the player, repetitive practice to produce mastery at an unconscious level, and reinforcement with rewards. These are strategies that could be put to better use in non-violent digital media, he argues. Unlike many other learning situations, video games usually require true mastery of skills at one level before the player can move to the next, and players often become nearly monomaniacal about conquering the challenge. This persistent fascination is a good thing, says Laurie Taylor, digital projects technology librarian at the University of Florida&apos;s Digital Library Center in Gainesville. She writes frequently about video games and their culture. Just learning how to play, Taylor says, creates enormous frustration, which has to be held in check for the player to progress. Even a notoriously violent game such as Grand Theft Auto can be valuable, she says, because "it&apos;s really fun and you don&apos;t actually break anything." Popular multiplayer games such as World of Warcraft, she adds, teach cooperation, strategic thinking, and controlling impulses to work within a structured social system. The Gentile study surveyed nearly 2,500 children ranging from elementary school age through late adolescence at two points about five months apart during the school year. Teachers completed a survey for each child at the same intervals. The survey asked participants whether they had been involved in physical fights and included a standardized method of determining hostile attitudes. It also asked which other children hit, kicked, or pushed others—and participants were asked to name their favorite video games along with how much time they spent playing them. The Gentiles found that, if a child played multiple violent video games, he or she was likely to become more aggressive—a result consistent with hundreds of other studies. By including a large number of subjects and measuring effects over time, the Gentiles&apos; study strengthened that finding. Still, media effects research is routinely subjected to scathing criticism. In an Internet document titled "Reality Bytes: Eight Myths About Video Games Debunked," Massachusetts Institute of Technology literature professor Henry Jenkins stresses the inconclusive nature of most such studies and the tendency by pundits to connect the dots to violent outbursts. He notes that "no research has found that violent video games are a primary factor" in triggering antisocial behavior, "or that violent video game play could turn an otherwise normal person into a killer." He&apos;ll get no quibbles from Douglas Gentile. "Most of the critics of the violent video-game literature fail to understand that aggression is multi-causal. None of us researchers are saying [violent video games are] the cause," he says. "I think it&apos;s a false dichotomy to ask whether games are good or bad"—they simply have "more than one effect." Nonetheless, Douglas Gentile believes the cumulative aggression seen in the current study reflects a low-grade social violence that is far more widespread and insidious than extreme but rare events such as the Columbine shootings. Middle school students, he says, "are mean and sarcastic to each other, and they think they&apos;re being funny. In fact, if you pull them aside and ask them to talk about it, they will say it hurts. The result of the constant barrage of media violence"—and not just in video games, he says—"is that we are creating and nourishing a culture of disrespect, which can be seen easily in how middle schoolers treat each other." Society will have to choose whether it values the skills taught by video games more than the negative effects of the violent ones. In the meantime, both children and adults continue to gobble up video games as fast as they can be produced, and partisans keep exchanging jabs. Douglas Gentile says he often gets hate mail from gamers. His favorites, he notes, say: "&apos;I&apos;ve played video games for years and it had no effect. And if you don&apos;t say so, I&apos;ll come and beat you up.&apos;"